INDICATIONS: To enhance postsurgical regeneration of skin. Especially helpful for post-op scarring. 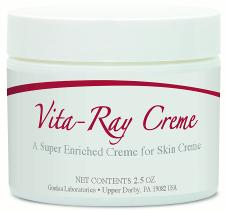 DESCRIPTION: Vita-Ray Creme allows nature’s healing agents to revitalize the skin. Vitamin A offers the cosmetic advantage of increasing the skin’s elasticity and softness, and rendering useful treatment of such seasonal problems as dryness, sun and wind burn because of its normalizing properties. Vitamin A can increase the amount of protein and thickness of the skin surface, thereby fortifying and improving the skin’s condition. Vitamin E revitalizes skin tissue because it is a natural healing agent that is readily absorbed into the skin. Significant evidence shows that Vitamin E Acetate, when topically applied, can play an important role in the war against premature skin aging. Vitamin E may also aid in wound healing (anti-scarring). Aloe Vera Gel has been used as a home remedy for skin care for thousands of years. DIRECTIONS: Massage into dry skin area once or twice daily or as prescribed by a Physician.